The first in a new series by Lauren Kate, the #1 New York Times bestselling author of the Fallen series, TEARDROP is an epic saga of heart-stopping romance, devastating secrets, and dark magic . . . a world where everything you love can be washed away. I really enjoyed Lauren Kate’s Fallen series. It was one of the first series’ I read with Fallen Angels, so I’m really excited to see how this new series is. Teardrop releases October 22, 2013. 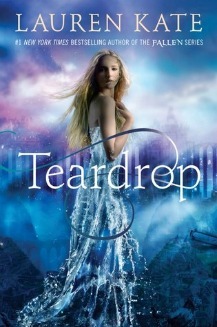 To pre-order your copy of Teardrop, click here. I was actually really excited to read this one a few months ago, but then I read some early reviews, and now I’m like, meh, doesn’t really sound that great. I’m not going to read it, but when you do, I look forward to reading your review! Awwwm that makes me sad. I really enjoyed her Fallen series. I haven’t read any reviews yet, but I’m still excited for it. I keep trying to win it! Haha. Dosn’t it look awesome? The cover is gorgeous, too! I adored the cover of this book. I didn’t really like her Fallen series, but I’ll definitely be checking out this one. The cover is sooo pretty! I enjoyed her Fallen series, so I’m excited to see how this one turns out! The cover is SO gorgeous! I’ve been trying to get my hands on an ARC, but I also can’t wait to see the finished hardcover. It looks like it’s gonna be all pretty and shiny!